Operators across the country are using the new pork terminology to their advantage. With USDA approved names for fourteen pork cuts, consumers can better understand what they’re ordering and chefs can position pork as premium. From spice-rubbed 16 oz. 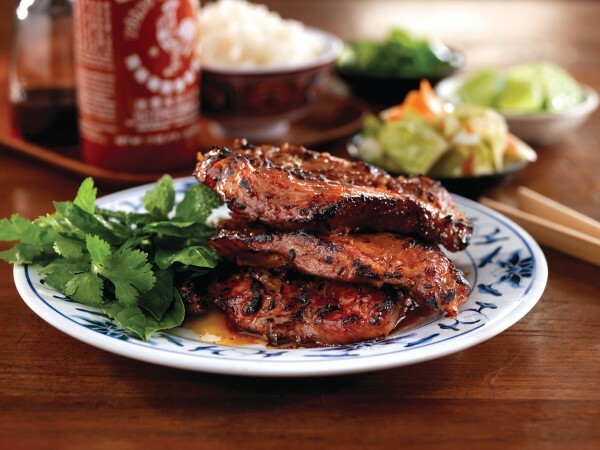 pork porterhouse chops to milk and honey-braised country-style ribs, new pork names make a statement. Take a look at our menuing report to see who’s making it work. Country-style Ribs are appearing on all types of menus across the country, from upscale celebrity chef restaurants to gourmet delis and inventive barbecue joints. These menus illustrate that country-style ribs can be utilized in many flavor combinations to fit any type of operation in all seasons. Publican, Executive Chef Paul Kahan, now serves a Country-style Rib with Chinese broccoli, spiced peanuts and kumquat agrodolce. Publican is a beer-focused restaurant located in Chicago, IL menuing pristine farmhouse fare. Cucina offers “Pork and Beans” made with country-style pork ribs and beans slow cooked with carrots served over rice. Chef Penny Murphy oversees this Gourmet Deli, located in Salt Lake City, UT. The Tulsa Rib Company opened in January of 1981 in Orange, CA, after Steve Parker realized the void in the restaurant scene for high quality barbecue. They are now famous for their “gourmet barbecue menu” which includes boneless Country-style Ribs. Hopleaf, a well-known Gastropub in Chicago, IL, is well regarded for their innovative menu. They are currently offering milk and honey-braised Country-style Pork Ribs, with a grilled cauliflower puree, Breakfast Stout collard greens and preserved root vegetables. Lambert’s Downtown Barbecue in Austin, TX, offers “inventive barbecue” that the New York Times called “newfangled ‘fancy barbecue.” Their menu features Country-style Pork Ribs rubbed with fennel and coriander, maple glazed and paired with apple and roasted fennel slaw. Chefs are taking pork sirloin and offering their customers “extraordinary” experiences with a variety of cooking techniques, from grilling to frying the meat until it is crispy and full of flavor. Downside Risk features Pork Sirloin – tender sirloin strips, grilled, with a mushroom rosemary demi-glace. This unique restaurant in Scottsdale, AZ, combines great food designed with weekly live music. Executive Chef Hermes Vargas serves up Carne Frita at Adobo’s Caribbean Grill in Sandy, UT. This meal is comprised of boneless pork sirloin fried until crispy served with onions and cilantro mojo. Bistro 18, an independent restaurant in Montclair, NJ, features New American Cuisine with European and Asian influence. George Kalivas, the owner, put together a team of chefs with diverse backgrounds to deliver unique cuisine, including a Char-Grilled Pork Sirloin Chop with lobster whipped potatoes and portabellos, in a sherry demi-glace. Chefs are adding innovative flavors to Pork Ribeye Chops like green tea smoked ginger, coffee and cocoa. Other chefs offer the Ribeye chop with more traditional pairings, such as sautéed mushrooms. However the Pork Ribeye Chop is menued, it transforms the menu from everyday to extraordinary. Rosebud Bistro, located in Nashville, TN, opened in 2013 with a menu that celebrates Regional European cuisine and a stellar wine selection. Executive Chef de Cuisine Anita Hartel offers a Pork Ribeye with green tea smoked ginger, whipped sweet potatoes, sautéed greens, and sake pork jus. Sanders restaurant, located in Grand Forks, ND, is featuring a Coffee and Cocoa Grilled Pork Ribeye on their specials menu for April. This includes a bone-in pork ribeye chop, rubbed with a cocoa and coffee based spice rub then grilled and served with sun dried cherry port wine demi-glace. Garlic John’s, a long-established regional Italian restaurant in Manchester Center, VT, offers a Prime Ribeye Pork Chop. The grilled boneless 8-oz. chop is topped with sautéed mushrooms in a light wine sauce. Merchant menus a Ribeye Pork Chop with cheesy root vegetable gratin, and orange gremolata. This casual farm to table restaurant in Madison, WI, celebrates the American craft movement with a passion for quality ingredients and honest cooking. 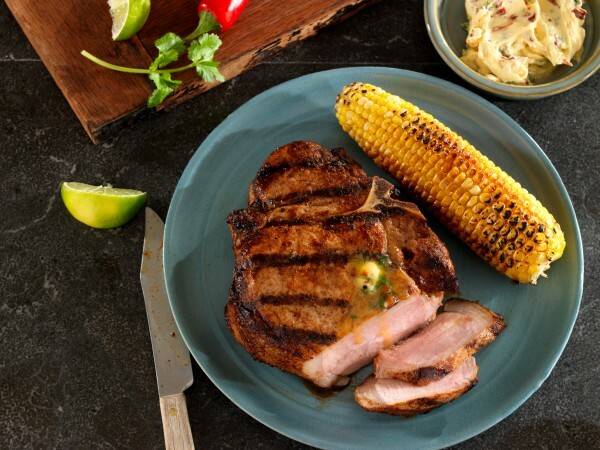 Pork Porterhouse Chop is a powerful way to position pork as a premium menu item. 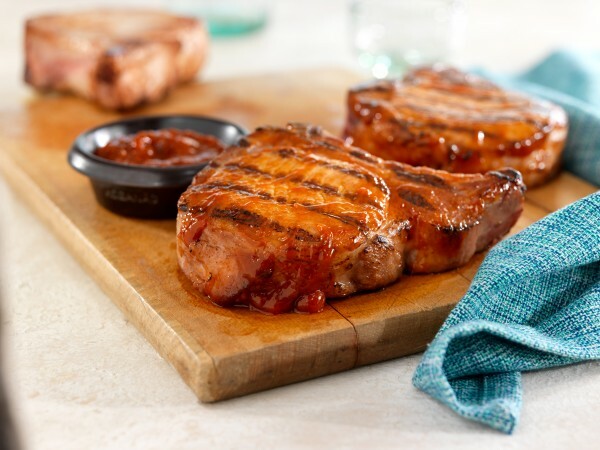 Restaurants are taking this nomenclature a step further by describing the Pork Porterhouse Chop with additional descriptors such as “prime” and “beautiful.” In addition to the menu descriptors, restaurants are utilizing flavorful rubs and unique glazes for added quality and appeal. TD Homer’s Grill is a family-friendly high-energy restaurant in Southington, CT, that features a Porterhouse Chop on their fall menu. The porterhouse pork chop is pan-seared with herb roasted potatoes, roasted butternut squash, and a housemade bourbon applesauce. The Hollow Bistro and Brew located in Clarence, NY prides itself on their great selection of food and drinks. The menu offers a Pork Porterhouse Chop with mustard and New York maple syrup glaze, and whipped sweet potatoes. Doug’s Downtown Grill, on Historic Main Street in Garden Grove, CA, offers a 16-oz. Prime Pork Porterhouse Chop. They mesquite grill this chop to perfection, and serve it with homemade applesauce. Eric’s Office Restaurant in Canadaigua, NY features a Root Beer Pork Porterhouse. Their thick cut, char-grilled pork porterhouse chop is glazed with a Saranac Root Beer reduction and served with Cheddar bacon smashed potatoes. Spoto’s Grill 131, in Seminole, FL, offers a Pork Porterhouse Chop, menued with a mushroom and mandarin orange Grand Marnier glaze and sweet potato mash. In the heart of the beautiful Allegheny Mountains of Pennsylvania, the Back Door Café serves tourists and locals the best fresh foods they have to offer. Chef Thomas M. Chulick C.E.C and Denise Thompson menu a 16-oz. 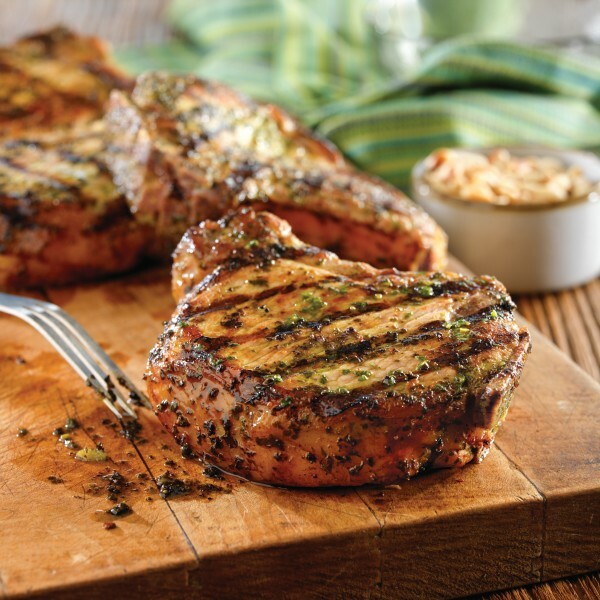 Pork Porterhouse Chop – brick oven roasted and dry spice rubbed with cinnamon, cumin, coriander and white pepper.